Amsterdam and Rotterdam are the two largest petroleum and coal harbours of Europe. Coal boats arrive from Colombia, USA, South Africa and Russia with 70% of the coal heading to Germany. Large protest camps have taken place in the last years. Amsterdam and Rotterdam are the two largest petroleum and coal harbours of Europe. Coal boats arrive from Colombia, USA, South Africa and Russia with 70% of the coal heading to Germany. Crude oil is imported from Russia, Norway, Saudi Arabia, U.K. and Nigeria, among other places. Via their exports of refined petroleum from the ports of Amsterdam and Rotterdam, companies such as the Dutch Vitol, the largest gasoline trader in the world, are responsible are systematically dumping toxins on West-African countries. Pollutants are wilfully added to gasoline and diesel up to levels that exceed European standards by three hundred times. Combustion of these fuels--commonly referred to by traders as 'African quality'--can lead to severe health problems and even premature death. Local activists say that the Netherlands may have a green reputation for its cycling infrastructure and progressive image, but this is obscuring the country's role in Europe’s fossil fuel economy. “Because of the bicycle lanes, you don’t see the coal ports any more.” While Rotterdam can considered the big fish, resistance has focused on Amsterdam so far due to strategic and logistical considerations. This is also where local activists experimented with the first two editions of the Climate Games in 2014 and 2015. As well as a series of occupations and blockades happening, targeting the NUON/Vattenfall coal fired power station in 2015, the coal port in 2016 and in 2017 the 'dirty diesel' terminal owned by Vitol, the largest independent gasoline trader in the world. Amsterdam Fossil Free is also running a campaign since beginning 2015 that includes demands for a fossil fuel free harbour. As a result of this pressure, the broader discussion around the use of coal in the Netherlands, as well as the influence of the Energiewende in Germany, the port of Amsterdam issued a declaration in March 2017 that coal will be phased out from the port by the year 2030. Activists welcomed the mile stone decision as a step in the right direction, while pointing out that much faster action is required to avoid escalating climate change. In 2017, a new and broad coalition of climate activists called 'Code Rood' (Code Red) called for mass civil disobedience against the fossil fuel industry in the port of Amsterdam. A a climate camp was organised from 22 to 26 June and a mass civil disobedience action took place on June 24th. 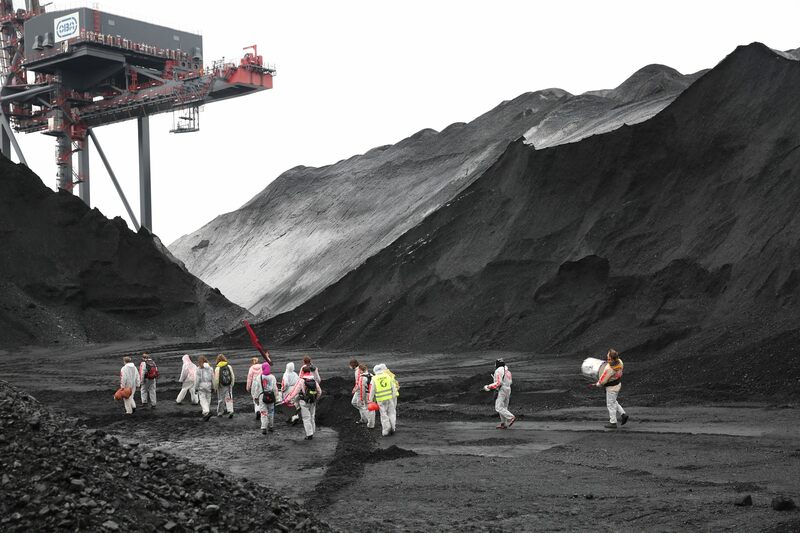 Some 300 people from the Netherlands, supported by groups coming from Belgium, Britain, Germany, France, Denmark and Sweden occupied Europe's second largest coal port, shutting down all operations for one day, making it the largest civil disobedience action in Dutch history. Engie (ENGIE) from France - Engie owns an 800 MW coal fired power station in the port of Rotterdam. The CO2 emission of this power station in 2016 was 3,1 million ton. Uniper (Uniper) from Germany - Uniper owns and operates the MPP3 power station in the port of Rotterdam, which consists of two units of 550MW. From the lignite mines in the Rhineland to the port of Amsterdam or the streets of Paris during the World Climate Summit, the struggles for climate justice are fought at more and more fronts. Beyond the red lines is the story of a growing movement that says “Enough! Here and no further!” and commits civil disobedience taking the transition towards a climate just society into its own hands. "Schone Schijn, Vieze Handen - Fossiele Haven Amsterdam in aanvaring met mondiaal CO2 budget"
Report by Fossil Free NL on the sustainability policy of Amsterdam, with a focus on the lack of targets to phase out fossil fuels from the port of Amsterdam. Mobilisation video for the June 24 mass civil disobedience action by Code Rood (Code Red). Video report on day 1 of the climate camp that Code Rood (Code Red) organised in the port of Amsterdam from June 22 to June 25 2017. Official video report on the mass blockade of the coal terminal of Amsterdam that Code Rood (Code Red) organised on June 24 2017. Report by video collective Unicorn Riot on the mass blockade of the coal terminal of Amsterdam that Code Rood (Code Red) organised on June 24 2017.